“I’ve got a really good feeling about this” is the line taken from the trailers of this film, as well as being a revamp of the classic line said in pretty much every Star Wars film (BB8 says it in TLJ, and it was absent from R1), but following the success of the last Star Wars story; Rogue One, this line was what I kept telling myself. I really loved Rogue One, to the point where I’d say that the last third of the film is probably some of my favourite Star Wars action in the entire series. I was sceptical at first, as the only Star Wars spin off film I know is the Clone Wars one, and I have only recently managed to finish it when showing my 4 year old daughter all of the Star Wars films (top parenting), but the franchise is an expansive universe (having been made smaller in recent years by Disney rewriting and disregarding the actual expanded universe), so that means that there are many stories worthy of telling in a galaxy far far away, and as such, I thought that Rogue One was surprisingly great. 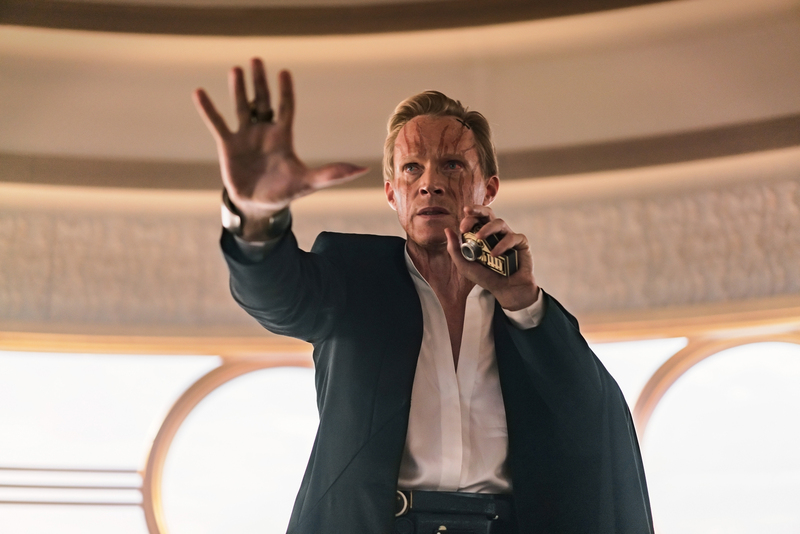 With that in mind, Solo emerged, continuing the new tradition of having a Star Wars Story brought out between each of the major films in the most recent trilogy. Now with the sour taste left in our mouths from The Last Jedi, which only came out the Christmas just gone, Solo felt a little too soon. Also, the trailers of the movie did not overly hook me in, at least not the same way that all the previous Star Wars films trailers, which generated a lot of buzz for me, but I didn’t feel that when I saw the trailers for Solo. Now having watching the film, I can say that I did actually really enjoy it. It was by no means the best Star Wars film (which, for me, Rogue One was a strong contender), but Solo was an enjoyable popcorn flick that just wanted to tell a fun action packed story. The story itself follows Han in a few years before we first see him in A New Hope, living as a street rat in the slums of Corellia, joining the Imperial Empire to become a pilot, before moving into a life of smuggling, robbery, and crime, to become the loveable scoundrel we all know. Along the way he joins Woody Harrelson’s character; Tobias Beckett, who becomes almost Han’s mentor, teaching him valuable lessons he will use in later films. At least this was how it was suppose to be portrayed, but I always felt that Han kind of had it figured out on his own in this film, and a lot of his risky moves actually paid off, where as I would have liked to see him fail a bit more, for Tobias to then help him out. 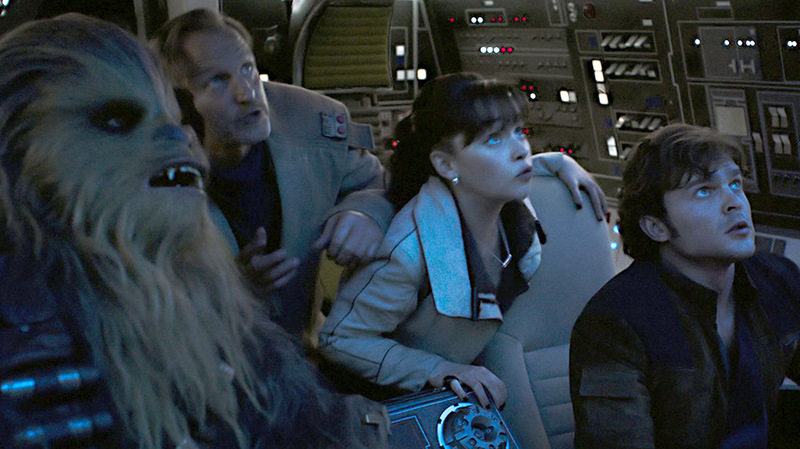 The movie shows his first encounter with a couple of fan favourite characters, such as Han first meeting his legendary Wookiee sidekick; Chewbacca, which was a nice introduction to the character, and actually gave him a bit more depth to his character than we have seen before. There is one scene about two thirds of the way through the movie where we see Chewie with a purpose and an ultimate goal in life, other than serving as Han’s first mate. The other classic Star Wars character who is acquainted is Lando Calrissian, played by Donald Glover, who we see as a gambling smuggler who is quite fond of his capes. Now for me, Donald Glover’s performance was one of the most outstanding things in this film. I thought he had the character spot on and his mannerisms really did make me imagine Donald as a young Billy Dee Williams. 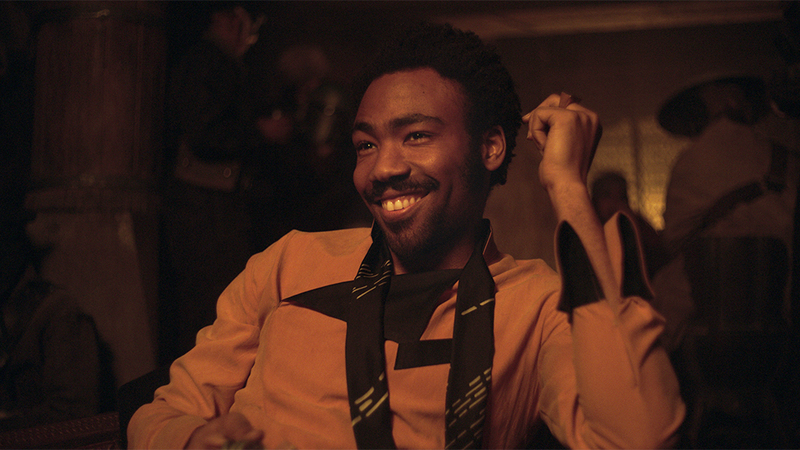 Apparently Glover and Williams met a number of times to discuss how the character would act and give him an insight into Lando himself, which could have easily contributed to the performance. I will say that the character is criminally underused, as he is abscent for a lot of the movie and doesn’t really get involved in many of the action set pieces, for which there are a lot of them, but we will discuss this in further detail later. Elsewhere on the cast is the Mother of Dragons herself; Emilia Clarke as Qi’ra, who is Han’s first love back on Corellia but becomes involved with a deadly crime syndicate leader in the time Han and her are apart. There is something that just doesn’t work with Emilia here. While her character is good, I do not believe that she was the right person for the job and as such I found a lot of her scenes actually distracting from the rest of the film and brought me back to reality, which is not something a film should really do, but it wasn’t a major issue with the movie. Woody Harrelson is good as always and the same can be said about Paul Bettany as Dryden Vos; the crime lord of the syndicate the movie is based around. As both actors did their jobs perfectly, but again with both of them, I never really felt they were utilised as much as they should have been. Tobias did have a lot of great moments however, and we can see a few little character attributes that Han picks up from him for later in life. The new droid this time; Lando’s co-pilot L3-37, was a bit of a wasted character. They had tried to make her unique and give her this anti-robotic oppression mentality, but I actually found this a little annoying. 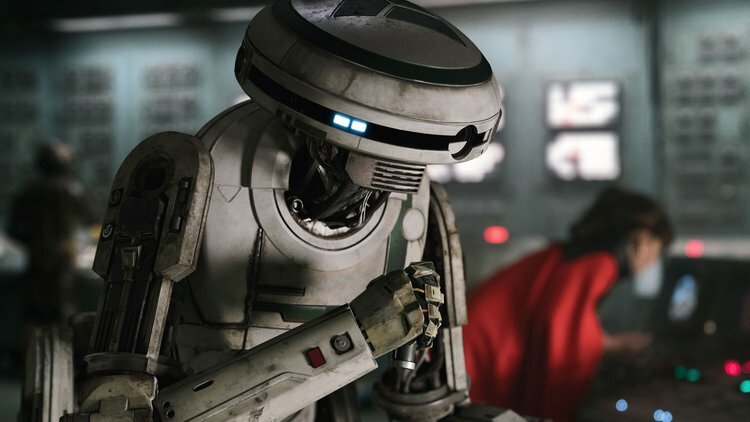 She did not have the same charm as K-2SO in Rogue One, and you can tell that they had desperately tried to reignite the magic that K-2 had created. Of course the main focus of the film is Alden Ehrenreich as Han Solo. Was he a good choice for the role? Yes. I think so. Not as good as Donald Glover’s Lando Calrissian, but Alden portrayed Han well enough for us to believe that this was the character in his youth. 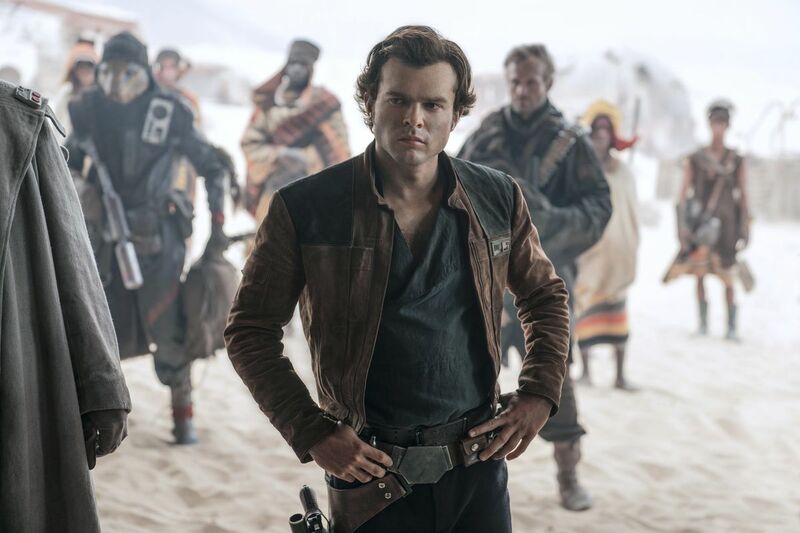 However, there were moments when I felt that the film did not create so much of the character development, as he already starts the film pretty much as Han Solo from the get go. A little character evolution would have been nice. There are a couple of great Han moments when he first meets Lando and is playing him at the card game Sabacc that felt like they had nailed the tone for the movie, and Solo as a character, but a lot of the time it showed Han in as many different action packed situations as possible. That for me was one of the let downs of Solo. From the start of it we are thrown into an action set piece without knowing too much of what is going on, and this scene lasts quite a while. Then before any character development, we see Solo in the middle of a war zone, then fighting the “beast” that it locked up there. In fact there are a few more action set pieces before we get to this camp fire scene, which is our first true character building moment, but by then it is a little too late and a few new faces are not in much more of the film and so it felt as if this scene should have been much earlier in the movie, with maybe another similar scene at this point in time. But that is just me. I enjoyed the characters, it is just that I would have liked to know more about them, instead of just seeing how they handle themselves in a fight. That is probably my biggest qualm for me; too many action scenes, which might seem like a strange thing to moan about, as normally films are disliked because of the opposite, but for me, I need a little more drive and motivation for these characters to be able to truly appreciate them in the heat of the moment. Solo felt as if it just moved from one action piece to another as quickly as the scene changed. An example of this is when Han performs the infamous Kessel Run (which was done in 12 parsecs, if you round down – which I thought was a really nice little touch), but whilst doing this space manoeuvre, along with an Imperial blockade and a maelstrom, the film throws in a giant space squid (it was in the trailers) as well at the same time, or really a few moments later, which felt needless unnecessary. I will praise the film for the fact that I felt that it was good for both people who are new to Star Wars (or at least not overly interested in the lore behind the expanded universe) as well as avid fan boys (like myself), as it was layered with multiple nods to the other films as the expanded universe, such as the mention of Scarif (the planet from Rogue One) and Bossk (the Trandoshan bounty Hunter), even the return of Warwick Davis’ character from The Phantom Menace; Weazle was great for people who remembered seeing him. These I felt were really nice touches. 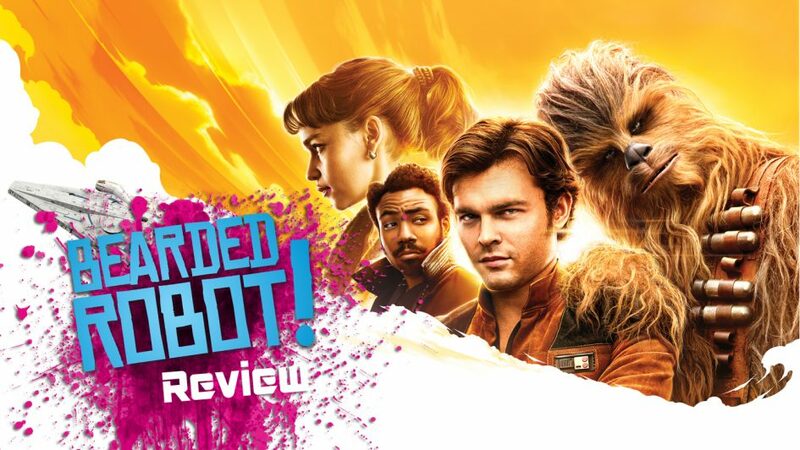 Overall, Solo is a fun action packed popcorn flick set in the Star Wars universe. It does not give too much depth to Han Solo as a character, but more shows him in some wacky adventure set before the events of when we see him before A New Hope. If you enjoyed Rogue One and the little side stories in between the main Star Wars series, or even if you want a little fun action film to lose yourself into for 2 hours, then you will enjoy Solo the same way that I did. Let’s get into this, as a few things need to be mentioned for us avid Star Wars fans. First of all are we lead to believe that the Cloud Riders are the original rebels? I found this an unnecessary shoe horned in and needless addition to the story of the rebel alliance. I felt that the ending between Han and Qi’ra did not end in a satisfyingly enough way that would allow him to move on and end up with Princess Leia a few years later, considering that she was his first love and he spent about 3 years wanting to get back to her, only for her to betray him and then run off to become the new crime lord. I felt that maybe Han would have followed her or tried to sort out their problems, but apparently Alden Ehrenreich is signed on for future Han Solo appearances, so maybe Solo will become part of a trilogy itself and we will see more of this story develop in later films? But as it stands, it was not a satisfying ending for their love. Finally, there is an amazing cameo at the end of the film and that for me is one of the main reasons that I wanted to see this movie (as it had already been spoilt for me). When Darth Maul appeared, complete with his robot legs and Sabre from the Clone Wars/Rebels shows, I was very excited. Even more so by the fact that it is the same actor as in The Phantom Menace. Of course if you are familiar with the expanded universe, then you all know that Maul survived getting cut in half on Naboo and become a ruthless crime boss. Ray Park has apparently been in talks to star in other Star Wars films, and with rumours that one of the next Star Wars stories is Kenobi, which apparently Ewan McGregor is interested in reprising his role of Obi Wan, so this gives me hopes of a live action grudge match between the exiled Jedi and the fallen Sith Zabrak! I know this was done in Star Wars: Rebels, which is canon, but it would be great to see it in real life. Exciting stuff for us fan boys and girls!